In Libya, the climate is Mediterranean in the thin coastal strip and desert in the interior. Actually, although the temperatures on the coast are typical of the Mediterranean climate, the rainfall level is very low, semi-desert in Tripolitania and Cirenaica, and even desert in the Gulf of Sidra (or Sirte). Only in the hills near the coast of Cyrenaica (called Jebel Akhdar), precipitation is between 400 and 700 millimeters (16 and 27.5 inches) per year, so much so that they are covered by a Maquis shrubland. Along the coast, which is the only plain area that receives non-sporadic rains, most of the rainfall occurs from October to early April, with a peak in December and January. The amount is usually low, between 200 and 350 mm (8 and 14 in) per year in Tripolitania and Cyrenaica, and between 100 and 200 mm (4 and 8 in) in the Gulf of Sirte (which is definitely desert in the southernmost part), while to the east of Cyrenaica, in the easternmost part of the coast, on the border with Egypt (see Tobruk), it drops again to around 100 mm (4 in). The rains on the coast are due to depressions coming from the Atlantic Ocean or the Mediterranean Sea, and between one depression and the other, there are long periods of good weather even in winter; since the period when the rain can fall is limited, during some years, a decrease in the winter rainfall may cause droughts, whose effects are felt until the following autumn. In summer, the sun shines and it almost never rains throughout Libya, although in the southern part, in full desert, some showers may occur because of the African monsoon, which affects the Sahel region in the warmest months, and whose extreme offshoots can sometimes arrive here. Along the coast, air humidity is high, though sea breezes blow in the afternoon, relieving the heat. Actually, in summer, the northern winds blow even at high altitude, since they are due to the baric configuration of the region, with a high pressure system over the western part of the Mediterranean and a low pressure system on the eastern side, and that's why the Libyan desert is not as hot as the Algerian desert. The average maximum temperature in summer ranges from 30 °C (86 °F) along the coast, to 35/37 °C (95/99 °F) in the north-central inland area, to 40/41 °C (104/406 °F) in the south. Throughout the year, but more often in spring and autumn, Libya can be affected by the Ghibli, a hot and dry wind, which is able to raise dust and cause sudden increases in temperature; this phenomenon is even more evident along the coast, where it also produces a sudden drop in relative humidity, which here is generally high because of the influence of the sea. In these cases, the temperature can exceed 40 °C (104 °F) from April to October even on the coast, while in winter it can reach 30 °C (86 °F). The main Libyan cities located on the coast (Tripoli, Benghazi, Misrata) have a Mediterranean climate, with mild, quite rainy winters and hot, sunny summers, with highs in July and August around 32 °C (90 °F) in the western part (see Tripoli, Al Khums) and 30 °C (86 °F) in the central and eastern parts, which are more affected by the northern winds that blow in summer in the eastern Mediterranean. Here are the average temperatures of Tripoli. Tripoli, located in the western part, is the rainiest city, and receives 330 millimeters (13 inches) of rain per year, with a peak of 60/70 mm (2.4/2.8 in) per month between November and January. In Benghazi, rainfall amounts to 260 mm (10.2 in) per year, while in Misrata, near the dry Gulf of Sirte, it amounts to just 190 mm (7.5 in); in Sirte, in the gulf of the same name, it's about 180 mm (7 in), and in Tobruk, located in the east, it drops to only 110 mm (4.3 in). Here is the average precipitation in Tripoli. Along the coast, the sky is normally clear in summer, while in winter, there is an alternation between sunny periods and bad weather periods. Here are the average sunshine hours per day in Tripoli. The sea in Libya is warm enough to swim in from July to October, while it is a bit cool in June and November. Proceeding inland, the summer temperature increases quite rapidly: highs in July and August reach 35 °C (95 °F) already at the Tripoli International Airport, 25 kilometers (15 miles) from the coast, and 37 °C (99 °F) in el-Azizia; the latter has been wrongly believed to be the hottest place in the world, due an incorrect measurement carried out in 1922. A special case is represented by Bayda, located at 600 meters (2,000 feet) above sea level, on the hills of Cyrenaica, which receives 540 mm (21 in) of rain per year. Here, in winter, owing to the altitude, it can even snow during cold waves. Here is the average precipitation in Bayda. In Bayda, the daily average temperature ranges from 10 °C (50 °F) in January and February to 23.5 °C (74 °F) in August. 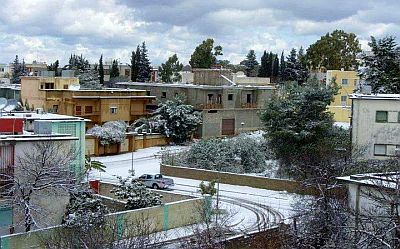 South of Tripoli, there is a mountain range, the Nafusa Mountains, where there are some cities located at an altitude of almost 1,000 meters (3,300 feet), such as Nalut, Zintan, Lefren, Gharyan, which, in winter, are slightly colder than the same Bayda. 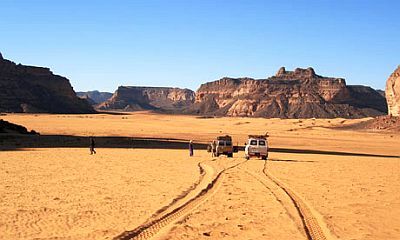 In the vast desert regions of Libya, good weather prevails throughout the year. During winter, the temperature range is high, in fact, nights are cold (the temperature can drop to around freezing, and even a few degrees below in the north-central part), while days are pleasant, around 20 °C (68 °F). The daytime temperature exceeds 30 °C (86 °F) from April to October. In summer, the highest recorded temperatures are around 50 °C (122 °F). The rains are very scarce and sporadic, in the form of downpours: some areas can see no rain for years. The desert is almost everywhere uninhabited, except near the oases, which are fed by water springs emerging from underground, such as the oases of Kufra and Sabha. Here is the average temperature of Sabha, located at 400 meters (1,300 feet) above sea level, in central-western Libya, at 27 degrees north latitude. The sun in the desert regularly shines throughout the year. While waiting for the conditions of the country to be normalized, we can give you some indication on the best period as regards to the climate. If you want to visit Tripoli, Benghazi and the main northern cities, you can choose spring and autumn, and in particular, from mid-March to mid-April and from mid-October to mid-November. If you want to visit the desert areas, you can choose the winter, from December to February, keeping in mind that it can get cold at night. The bathing season runs from mid-May to mid-October, although, as previously mentioned, the sea begins to be warm in July. In winter: in Tripoli and the coast, bring spring/autumn clothes, a jacket and a sweater, and a raincoat or umbrella. In the desert, bring spring/autumn clothes (light for the day), a scarf for the wind-borne sand and dust, a sweater, a wind jacket, and a warm jacket for the night. In Bayda and the Nafusa Mountains, it's better to add some warm clothes, such as a sweater or fleece, and a down jacket. In summer: in general, bring loose-fitting, light-colored clothing, light and long shirts and pants, a wide-brimmed hat, a light scarf, sunglasses (even graduated instead of contact lenses), and comfortable and breathable shoes. On the coast, a light sweatshirt for the evening. In the desert, a sweatshirt for the night, a sleeping bag for outdoor overnight stays, desert boots or sandals. It's best for women to avoid shorts and miniskirts.